> SAP > Getting The Most Out of Mobile Analytics? 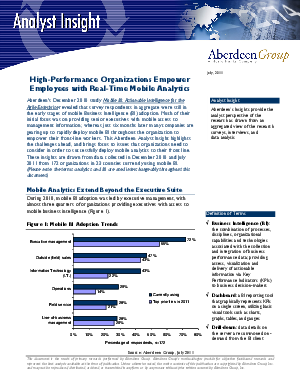 Explore the Aberdeen e-book "High-Performance Organizations Empower Employees with Real-Time Mobile Analytics" - and see how you can get the edge. Hear from industry experts how to effectively roll out your mobile analytics strategy, and empower your front-line workers with real-time insight and tools. Don't confine intelligent decisions to desktops - be ahead of the mobile analytics curve.